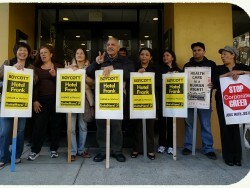 Hotel Frank workers and UNITE HERE Local 2 have driven the wannabe union-busting owners and operators of the hotel – AEW Capital Management and Provenance Hotels – out of San Francisco. The Hotel Frank bosses have tucked their tails between their legs, thrown a big wad of money at the workers, sold the hotel, and fled town. For the last two years, workers at this small, boutique hotel, just a block off Union Square at Geary and Mason, maintained rambunctious, loud and near-daily picket lines, heard and witnessed by many thousands of tourists and residents. Local 2 staged several rallies and mass demonstrations. 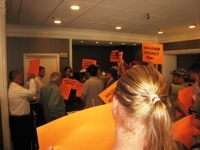 On September 12, just two days before the hotel shut down, Hotel Frank workers ratified a settlement agreement with AEW and Provenance. The bosses are coughing up close to a million bucks for medical and pension payments they had failed to pay. The hotel also made sizeable severance payments to the workers, including six months of medical coverage going forward, and reinstated three workers who had been unfairly fired, including myself. While we are still far from victory, our solidarity and tenacity paid off. The protracted warfare at San Francisco’s Hotel Frank is a bold display of the tenacity and resilience of a small group of workers in a knock-down-drag-out fight with union-busting bosses in one of the most difficult periods for labor in decades. Hotel Frank is a small “boutique” hotel. Consequently, we are a small group of workers, about 35 in total, but brave and unrelenting. The fightback at Hotel Frank began in earnest last September, when workers marched into the lobby of Wells Fargo’s world headquarters in the Financial District and declared a boycott. Since then we have staged regular picket lines in our very public space one block from Union Square. A non-traditional alliance of workers in Portland and Seattle organized a Day of Solidarity with Hotel Frank Workers last Friday, April 29. 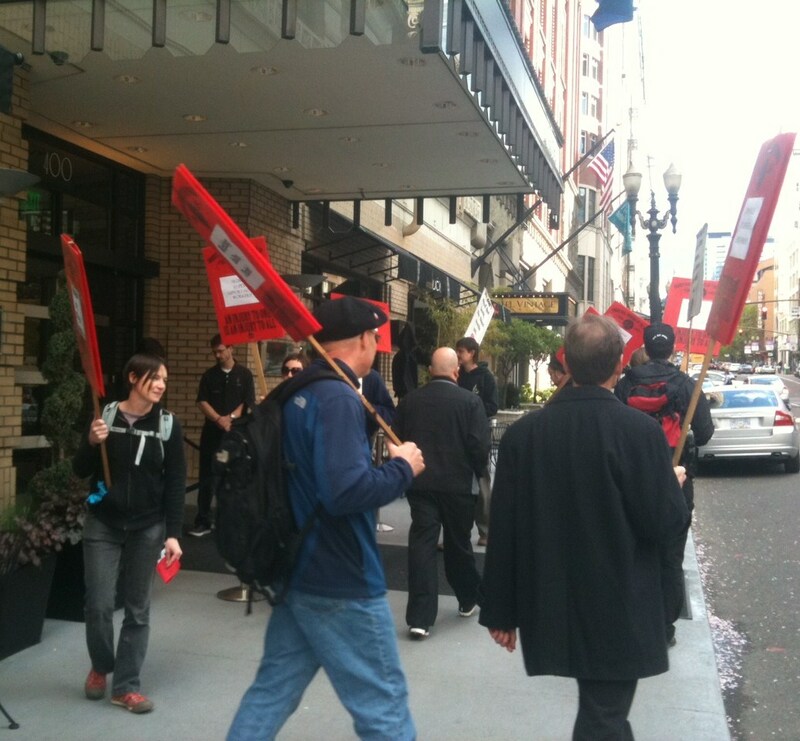 The Portland Industrial Workers of the World (IWW), the Seattle Solidarity Network, and Hotel Frank workers were all on the streets picketing Provenance hotels. Provenance is the hotel management company that threw the UNITE HERE Local 2 contract at Hotel Frank in the trash almost a year ago. Yoshi’s has hotel workers singing the blues. Will Sweet Honey In The Rock be next? The boosters behind the redevelopment of the Fillmore district call it the “Heart and Soul of San Francisco.” And at the center of that redevelopment is Yoshi’s, the shiny new jazz venue that anchors the Jazz Heritage Center and that San Francisco’s tax payers loaned its owners $7.2 million to build. But Yoshi’s is more than a little lacking in heart and soul right now, as it callously violates the worker-called boycott of Hotel Frank, a small hotel near Union Square. The 35 workers at Hotel Frank are the real heart and soul of San Francisco. Since Wells Fargo took over the hotel – once part of Frank Lembi’s now-defunct real estate empire – in a foreclosure sale last May, these workers have had to fight day and night to maintain a modicum of dignity on the job. Wells Fargo installed a new hotel management company from Portland, Oregon called Provenance. Provenance’s first act on the job? Taking the union contract and throwing it in the trash. San Francisco’s small, fashionable Hotel Frank is strategically located in the center of downtown just around the corner from two world-acclaimed theatres, the Curran and ACT. But no one imagined the chic hotel that advertises itself as “hip” and “liberating” would itself stage a performance that has people clamoring outside in ticket lines. Oh, my mistake, I meant picket lines. 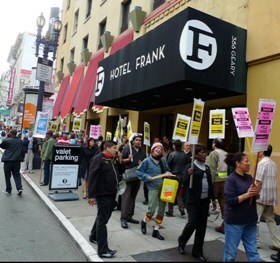 Pickets did indeed start up at the Hotel Frank after new management, Provenance, unilaterally announced in May 2010 the cancellation of all union contracts at both the Frank and its sister among the so-called boutiques, the Hotel Metropolis. This was a stunning announcement. Provenance was actually hired by Wells Fargo, Trustee of the foreclosure of the Hotel Frank and Metropolis when the previous owners, pretty shady characters themselves as we shall learn, made a series of incredibly stupid business decisions that are still disdainfully ridiculed in business circles.